In line with the AKP government’s rudimentary understanding of “democracy” that considers it synonymous with elections, Erdoğan has reiterated countless times that the solution to all problems, including the allegations against his government, lay in that holy of holies: the Ballot Box. Election poster featuring Turkish PM Erdoğan. Demotix/Alexandros Michailidis. Most self-proclaimed political analysts in Turkey are long since finished with analysing the results of the local elections on March 30 and half way through their exchange on the different ways in which his victory could influence PM Recep Tayyip Erdoğan’s decision to run for presidency in August. 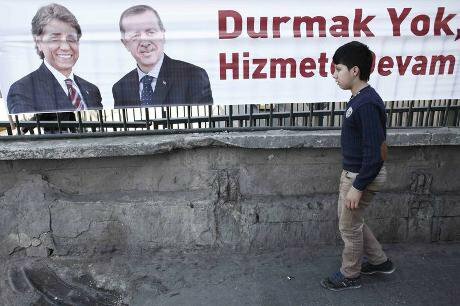 Let us state the obvious, the Justice and Development Party (AKP) won Turkey’s local elections. Though the official results are yet to be announced by the High Electoral Council (YSK), AKP candidates appear to have gained about 43.2 percent of the votes, followed by the Republican People’s Party (CHP) as a distant second [26.1]; the Nationalist Movement Party (MHP) [16%], and the Peace and Democracy Party (BDP) [6%]. As usual in the country’s recent history, the turnout was quite high: over 85% of the 52 million voters in total went to the polls. Under normal circumstances, such a declaration would indeed be fitting before moving to the really juicy bit of analysis. For instance, the results could be interpreted as predictable and mundane insofar as the governing AKP received about the average of two previous elections in 2009 and 2011 while the opposition parties increased their cumulative share by only five points or so, reaching up to almost 50 percent. Besides a few changes here and there, the results did not cause many surprises. One could then say that this is mainly because (a) the post-2002 electoral trend whereby the support for smaller parties have been increasingly flowing towards the big-three parliamentary parties goes on; (b) the AKP has lost a small portion of its right-wing nationalist support base to MHP, which is rather uninteresting given the fact that some sort of erosion in electoral support is more than likely after the party’s uninterrupted rule since 2002; (c) the AKP’s resilience in maintaining its electoral dominance even after a series of scandals is a telling sign that the main opposition party in Turkey lacks the vigilance and capacity to offer a real alternative both at the local and national levels; (d) there is also steady and overwhelming support for the pro-Kurdish political parties in south-eastern Turkey, which signals that we are probably going to witness the formation of an autonomous Kurdish administration in the region in the course of coming few years. But the pre-elections atmosphere was anything but normal and March 30 was far from a mundane election day. During summer 2013, Turkey witnessed the biggest popular uprising in its recent history following the AKP government’s uncompromising project of converting Istanbul’s Gezi Park into a building complex of shopping malls and luxury residences despite serious objections. A few months after police brutally suppressed these protests, killing seven and injuring thousands, sons of three ministers, along with dozens of businessmen, were taken into custody on 17 December 2013 as part of a widespread corruption investigation implicating many high-level members of the government. As this process was cut short by the government’s destructive counter attack that reassigned thousands of officials carrying out the investigation and brought much of the judiciary under the executive supervision, a series of apparently incriminating phone conversations that allegedly took place between Erdoğan, his family and staff began to appear on the internet shortly before the elections. Listened to by millions of users, these illegally taped conversations alleged that Erdoğan and his close circle did not only orchestrate the corruption networks but also actively pressurized the judiciary and media to cover them up and consolidate the government’s authority over ever-expanding spheres of Turkish state and society. The latest recordings posted on YouTube just days before the elections also suggested that members of the government were even involved in illegal arms shipment to Nigeria and weighed options to sparking a war with Syria. Although Erdoğan (tacitly or explicitly) confirmed the authenticity of many of those leaked tapes, he insisted that they, just like the corruption investigation, were the ‘villainous’ acts of a malicious and criminal ‘parallel structure’ whose members have infiltrated into the institutions of the Turkish state and abused their power to overthrow the government. As mentioned before, especially since the Gezi protests Erdoğan gradually transformed this ominous figure of the “enemy” through an unprecedentedly antagonistic discourse, automatically designating all opposition or even criticism against his government, both domestic and foreign, as part of a global conspiracy against the Turkish “people” and their one and only true embodiment in politics: the AKP. Within the borders of such a discourse that equalized the AKP supporters with the “people” and the rest with the “enemy”, Erdoğan could perfectly justify all the controversial policies of his government, including much-criticized bans on Twitter and YouTube, as necessary acts of defence in order to level the ground in a war against a cunning “enemy” –before the “people” themselves could strike the real blow in the local elections. In line with the AKP government’s rudimentary understanding of “democracy” that considers it synonymous with elections, Erdoğan has reiterated countless times that the solution to all problems, including the allegations against his government, lay in that holy of holies: the Ballot Box. This means that Erdoğan has consciously and persistently transformed an otherwise mundane local election into not only an all-out war between the “people” and their “enemies” but also a divine court of justice to try him, his family and government, once and for all. Standing straight and proud in this court of his own making where he will face serious allegations of corruption and abuse of authority, the AKP leader reverently begged the jury, the “people”, to make their decision based on nothing but their conscience and declared that he and his government would respect their judgment either way. What if the court is biassed? In two previous articles I have pointed out the grave danger the AKP government’s recent legislative and administrative changes posed for the rule of law, particularly the principle of free and fair elections in Turkey. In order to avert what it considers as an existential threat posed by the followers of a formidable enemy, i.e. the Gülen movement, the AKP government has tightened its grip over the judiciary, media and law enforcement agencies to such an extent that many institutions and actors functioning within these three key areas have become mere weapons in its hands, ready to be used against any “enemy” identified as such. But it is of course the very independence of those institutions and actors, rather than their blind obedience to governmental directives, which guarantees that the principle of free and fair elections is upheld and the sanctity of Erdoğan’s much-beloved ballot box preserved. They all have indispensable roles for ensuring that the voting and counting processes proceeds in as transparent, secure and free a way as possible in order to truly reflect the “people’s will”. The Supreme Electoral Board (YSK) as part of the judiciary coordinates the entire electoral process, releases the voter and candidate lists, appoints observers, counts votes, announces official results, and resolves possible disputes. The media, on the other hand, delivers unbiassed coverage of the candidates, constituencies and results to the public, while police and gendarmerie are responsible for providing a secure atmosphere in which the voters can make their decisions solely based on their free will. Any reasonable doubt over the independence and political neutrality of these institutions and their key members would certainly taint the elections. These were admittedly very elementary points to be made with respect to the overall functioning of a democratic regime, but unfortunately could not be taken for granted in contemporary Turkish politics. Far from being unfounded or ill-intended, these doubts over the impartiality of key institutions have been strengthened on many recent occasions where, in complete disregard for the rule of law and fundamental principles of liberal democracy, they have instead demonstrated a chilling obedience to government directives. Newly appointed members of the judiciary have promptly released all arrested suspects of the corruption investigation and put a gagging order on opposition media not to discuss the contents of leaked conversations. Besides their “epic” suppression of Gezi protests, police chiefs, on the other hand, have shown an extraordinary resilience in their refusal to carry out the prosecutors’ search and arrest orders for various suspects close to the government. Finally a major part of the Turkish media have gained a rather shameful, yet well-deserved, reputation as the mouthpiece of PM Erdoğan, due to their utter incapacity to report a single piece of news or commentary critical of the government, especially since the Gezi protests. Leaked conversations (confirmed by both parties) even showed that there was not only a self-censorship mechanism at work in the pro-government media but also direct interference on the part of Erdoğan and his staff in content, especially in such cases where an “unpleasant” character like an opposition party leader or a critical commentator is given a platform to speak his/her mind. In both of those articles, therefore, I had to conclude that the irrational pattern in which the AKP government advanced its struggle against the Gülen Movement gave way to such serious doubts that one cannot be sure if the election results would indisputably reflect the voters’ will anymore, simply because the institutions and actors who are trusted with the authority to guarantee it are converted into weapons to suppress any and all opposition against the AKP rule. Unfortunately, this is exactly what happened on the night of March 30 all around Turkey: the Ballot Box, the Holy Grail of AKP’s legitimacy, is tainted. To begin with, once the ballots were closed and counting began, something that was unprecedented in previous elections occurred: two main news agencies providing minute-by-minute updates for all TV channels and websites began to release wildly different results. The state-owned Anadolu Agency, headed by an ex-press agent of PM Erdoğan, reported a sweeping lead for the AKP candidates in key cities such as Istanbul and Ankara where the race was expected to be neck-to-neck, whereas the Cihan News Agency, known for its close affiliation with Gülen Movement, showed a much closer race. In hundreds of districts, including large Metropolitan municipalities, the elections led to heavily disputed results. On the day of the election, at least 1418 cases of fraud were reported. Power outtages in 35 cities, some lasting throughout the night, forced many voting centres to count votes by candlelight and left election observers incapacitated as thousands of ballots went missing, only to be found torn and burnt in the dumpsters next day. At least nine people, including one district-level candidate, were killed. In Kurdish-dominated Ceylanpınar town, near the Syrian border, where the AKP candidate had earlier announced his victory, discovery of several burnt ballot slips for the pro-Kurdish BDP led to mass protests and a de facto state of emergency is declared as the riot police fired tear gas and water cannon. Most significant and telling of all, however, is certainly the ongoing dispute over the race for the mayor of Ankara Metropolitan Municipality where 3.27 million votes were cast. From the very beginning it was expected that the race between the incumbent Melih Gökçek (AKP) and Mansur Yavaş (CHP) would be a very close one. On election night, however, the data flow to news agencies abruptly stopped around 03:00 when the difference between two candidates came down to just under 2,500 votes. With more than 200 thousand ballots from CHP-dominated Çankaya district alone still to be registered on the YSK’s electronic database, reports came in that a Minister from the AKP government paid a visit to the YSK main office in Ankara, while an advisor to PM Erdoğan along with Gökçek’s own staff were seen inside two other local election offices where the results were put into the electronic database. Police officers were photographed as they blocked entry to those buildings for hours, even to some opposition MPs. Once the data flow to news agencies was restored after an hour-long break, Gökçek instantly emerged victorious by 20,000 votes, which gradually increased to 24,000 when the counting was finalized during the early hours of morning. As supporters of Yavaş camped in front of the YSK offices to protest, chanting “thieves” and “burglars”, a massive team of tech-savvy volunteers filled the CHP headquarters in Ankara to collect all 12,235 ballot box slips signed by election observers and compare them with the results. Various statistical analyses also point out that there is quite a reasonable ground to be suspicious of a systematic attempt of electoral fraud in Ankara. Yavaş and other CHP representatives announced that they have documented large number of inconsistencies and submitted their objections to YSK. Police, in the meantime, used tear gas, plastic bullets and water cannons against the protestors as usual. Shockingly, the Energy Minister’s completely serious statement that the country-wide electricity cuts were triggered by a straw cat walking into a transformer unit fell short of convincing the opposition. The elections yielded to highly questionable results. In fact, they are the most dubious ones in Turkey’s recent history, disputed by all three opposition parties. Many in big metropolises like Ankara, Istanbul and Antalya as well as in smaller districts of Kurdish dominated eastern regions consider March 30 a sham. The political atmosphere is tenser than ever before as the opposition parties wait for the YSK’s response to objections and their supporters still protest in the streets against a heavy-handed police response. Combined with the fact that 70 percent of the people in Turkey believe the AKP ministers are involved in corruption and 60 percent agree the government tried to cover up the investigation by exerting pressure on the police and judiciary, this may ultimately mean that the very last source of legitimacy for the government’s rule, i.e. electoral victory, is crumbling too. This is certainly not a prophetic statement claiming that Erdoğan’s days are numbered or anything of that sort. It is just a reminder that before hastily losing ourselves in various scenarios of how exactly Erdoğan –now that he has “won” the elections– will unleash his purge against the “enemies of the people”, it might be wise to consider the possibility that the YSK’s decisions in the next week can give birth to a whole new legitimacy crisis for the government. Because if the decisions indicate that the prospect of losing power has scared the AKP so much so that it actually violated the sanctity of the Ballot Box, the one and only source of political legitimacy Erdoğan has ever acknowledged, then all the straw cats in Turkey may not be enough to vindicate the government of such a crime. Due to the multilevel nature of the local elections in Turkey (mayoral elections on metropolitan regions and other cities, city councils, district councils etc. ), the city council votes used to be taken as the most representative for parties’ overall support. The figures for 2004 and 2009 local elections are based on those results. To give a concrete example, share of votes for the AKP candidates in 2009 were: 38.39% (City Councils), 42.19% (Metropolitan District Mayors), and 38.64% (City Mayors). But the facts that (1) the number of Metropolitan cities have been increased from 16 in 2009 to 30 in 2014; and (2) legislative changes have done away with the voting for City Councils in those Metropolitan cities, alter the entire system of principles of voting and representation for a significant portion of Turkey, making it near impossible to compare the March 30 elections with previous ones. Thus the party-based results for 2014 elections displayed here are calculated by aggregating two separate results: (a) district council votes in 30 metropolitan cities and (b) city council votes in the remaining 51 cities. In March 30 elections, the pro-Kurdish movement decided to run two parties in parallel: BDP in the Kurdish-dominated southeast and the Peoples’ Democratic Party (HDP) in the rest of the country. Hence the unusual abbreviation combining both: B/HDP. It is the latest successors of pro-Kurdish parties in Turkey’s recent history, which were all closed down by the Constitutional Court for ’becoming a focal point of activities against the unity of the Turkish state, country and nation’ in 1993, 1994, 2003 and 2009. Thus the figures combined under one column here may be read more appropriately pro-Kurdish support, regardless of the party name and electoral alliances. See the article by Casier et.al. (2011) for a brief and accessible account of pro-Kurdish political initiatives in Turkey’s recent history. In order to circumvent Turkey’s unusually high electoral threshold of 10%, in recent general elections candidates from the pro-Kurdish parties run as independent. Thus the figures for 2002, 2007 and 2011 are based on the share those “independent” candidates affiliated with the pro-Kurdish parties received in those elections. The incumbent mayor of Tillo District of Siirt from AKP, Mesut Menduhoglu, was arrested in relation to the killing of Behmen Aydin who ran up against him from Felicity Party (SP) and was stabbed to death in front of his house the day after the election.